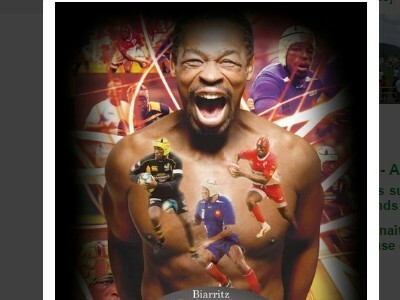 The famous rugby player Serge Betsen, ended his career with a great and memorable jubilee. VIP stars, President’s XV, Serge’s supporters…everybody was here to honour one last time, their hero of the oval ball. On Wednesday, June 6th, the day began when the Biarritz Olympique children aged 12 to 17 arrived as well as the children of two of the new branches of the association in Clichy and Val de Marne (Paris suburbs). They could attend a presentation of the Serge Betsen Academy, and participate to a defence workshop led by Serge Betsen himself and trainers of the Biarritz Olympique. At 6.00 pm the Aguilera Stadium opened its doors to welcome more than 7 000 people who came to show their attachment to this generous man they encouraged during many years! Two stands for the Serge Betsen Academy were organised by the volunteers of the association, and exhibited a presentation about the living conditions in Cameroon and the SBA work there. All along the jubilee, SBA branded souvenirs were distributed to our generous donators. This sporty event started with a VIP touch rugby match including huge retired rugby players or other sportsmen among which Christophe Dominici, Bixente Lizarazu, Olivier Roumat, Gregory Coupet and much more…all dressed in 1900’s jersey. Meanwhile a Pre-match VIP Cocktail buffet was organised in a room of the Biarritz Olympique to mix fans and famous sportsmen. At 8.15 pm a rugby match between the President’s XV and the Serge Betsen Selection among which they were Jeremy Castex, Imanol Harinordoquy, Benoît Auguste…During the half-time, the brilliant choral group « Chœur Oldarra » offered the audience melodious Basque songs. This mythical match caused Serge Betsen an injury needing three stitches after Frédéric Michalak tackling, but nothing serious enough to worry the brilliant rugby player! Despite the defeat of Serge’s team vs the President’s XV (54-14), the warmth took part of all the event. A post-match VIP cocktail took place at 10.00 pm to happily end the party, always with the SBA presence. Different speeches were made, first of all by Serge Betsen who thanked all his colleagues and participants for coming to this nice evening…a moving speech that concluded the jubilee! Finally, Cookie, a singer from Biarritz, dedicated a song to Serge: a nice tribute to thank the rugby player who made so much for the Biarritz Olympique during 16 years. Of course a speech was given for the Serge Betsen Academy, in order to tell the story of the association as well as its goals. After that an auction took place and proposed a helmet, espadrilles, bouclier de Brennus, rugby balls, signed tee-shirts and one day with Mr. Betsen. The benefits of these auctions have been transferred to the Serge Betsen Academy. This jubilee will remain in all supporters’ and Serge Betsen himself minds. We will remember the happiness that Mr. Betsen gave on the rugby fields during these last 20 years and of his generosity he shared through rugby as well as through his association he’s been working for during 8 years.